Earlier this week Pele joined Kylian Mbappe at a sponsor event in Paris in a first-meeting between the Brazilian football great and the PSG player, who at the age of 19 won the World Cup with France. After the meeting with Mbappe, Pele fell ill overnight and had to be admitted to a Paris hospital as a ‘precautionary measure’ according to his representatives. The situation was not life-threatening. He was diagnosed with urinary infection, but Pepito Fornos, Pele’s spokesman and close friend said that “everything is under control” and that Pele will need to remain a few more days in the hospital. 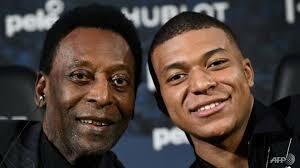 Mbappe and Pele had been scheduled to meet late last year but the event at the time had to be postponed because of Pele’s health.